A smuggler was caught trying to enter Spain after a suspiciously large bulge in his pants turned out to be a stash of drugs. The 43-year-old had attached a plastic container to his privates with more than a pound of cocaine inside – but was searched as he flew into Madrid Airport from Costa Rica. Officers examined his hand luggage and found nothing before turning their attention to his trousers and the large object between his legs.The bulge was still noticeable – as a photo issued by police revealed – despite the fact he was wearing a pair of black boxer shorts over pants with a floral design on them. 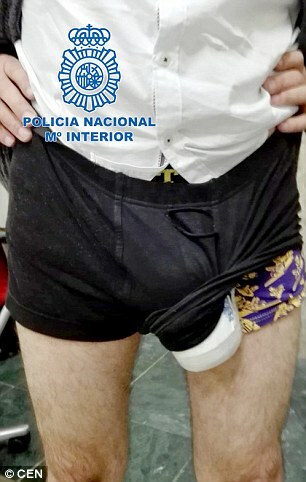 Spanish police couldn’t resist the obvious pun as they tweeted a picture of the trafficker alongside the message: ‘A suspicious package between his legs.’ But the unnamed detainee wasn’t laughing last night after going before a judge and being told he faced a prison sentence of up to three years if found guilty of drugs smuggling. A judicial probe is ongoing. Police at Madrid airport are used to catching traffickers who resort to novel ways of trying to smuggle their drugs into Spain. They once arrested a 92-year-old woman in a wheelchair who had four kilos of the drug hidden under her clothes. She was caught after a female companion pretending to be her granddaughter took fright and fled when customs officers stopped them soon after their arrival. Police arrested the second woman, a 44-year-old, after a chase through the airport. In January 2014 airport police arrested a Portuguese pair who hit 1.2 kilos of the class A drug under their wigs. Weeks earlier a man was arrested was arrested after trying to smuggle a stash of cocaine through Barajas Airport stuffed inside his artificial leg. The unnamed Peruvian was pulled aside by authorities after he got off a flight from Panama. Spain’s close ties with its former colonies in Latin America, a major cocaine-producing region, have made it a key entry point for the drug in Europe.